This set of Deliverables has 4 parts, due at the beginning of class on September 14.
and a 30-page article, Generative Art Theory (2003) by Philip Galanter. Categorize your blog post with the WordPress category, 02-Reading. Please note that this LO component is due 9/21, not 9/14. This deliverable will be your second Looking Outwards report. Our topic is Generative Art: art whose forms (images, sculptures, etc.) have been generated by algorithms -- algorithms created by artists, designers, architects, musicians, and poets. You are to identify a generative project you like, and write about it. The list of blogs and feeds here. A web site of Generative Art Links by Mikael Hvidtfeldt Christensen. The Wikipedia article on Generative Art (could be helpful to skim). Generative Artists - 3rd Generation and younger (active since late '90s): Marius Watz, Lia, Casey Reas, Kate Compton, Michael Hansmeyer, Everest Pipkin, Quayola, Jonathan McCabe, Allison Parrish, Mitchell Whitelaw, Tina Frank, Iñigo Quílez, Joshua Davis, David Wicks, Robert Hodgin, Dr. Woohoo, Erik Natzke, Darius Kazemi, Dave Bollinger, Moka, Matt Pearson, Alex Dragulescu, Jared Tarbell, Memo Akten, Tatiana Vilela dos Santos, Glen Marshall, Holger Lippmann, Markos Kay, Jessica Rosenkrantz & Nervous System, Marcin Ignac, Sabrina Verhage, Leonardo Solaas, Saskia Freeke, Mario Klingemann, Deborah Schmidt, Altered Qualia, Leander Herzog, Madeline Gannon, Caitlin Morris, Neri Oxman, Danny Brown, Anastasia Opara. What do you admire about the work, and why do you admire these aspects of it? It what ways are the creator's artistic sensibilities manifest in their algorithm? What is the artwork's effective complexity? Discuss the way that the artist has balanced order and disorder. Link (if possible) to the work. To the best of your abilities, be sure to provide the creator's name, title of the work, and year of creation. Embed an image of the project. Embed a YouTube/Vimeo video of the project (if available). Label your blog post with the Category, LookingOutwards02. Title your blog post, nickname-LookingOutwards02. You have been provided with some inexpensive versions of classic early-cinema devices: Praxinoscopes and Zoetropes. As a warmup for Part 4 of this week's deliverables, you are to write code to produce an animation for one of these devices. Keep it simple -- this is meant as a fun, creative warmup. It is not a graded assignment. The templates provide a function called drawArtFrame(). Your job is to put your own drawing code into this function. Currently there is a "sample" drawing there, and some guidelines that indicate the location of the origin. If you run the code and press 'f', the code will export a series of frame images into your sketch (or Downloads) folder. If you run the code and press 'p', the code will export a PDF (or single PNG) containing the design to be printed and placed in the device. 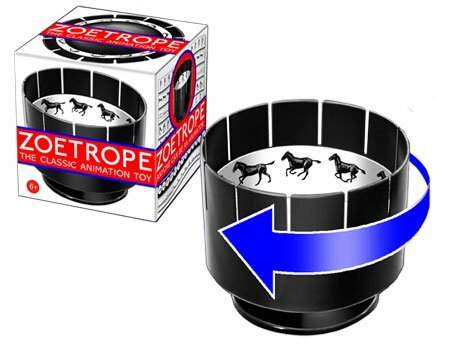 Zoetropes in general are dim, because they must be viewed through a tiny slit. 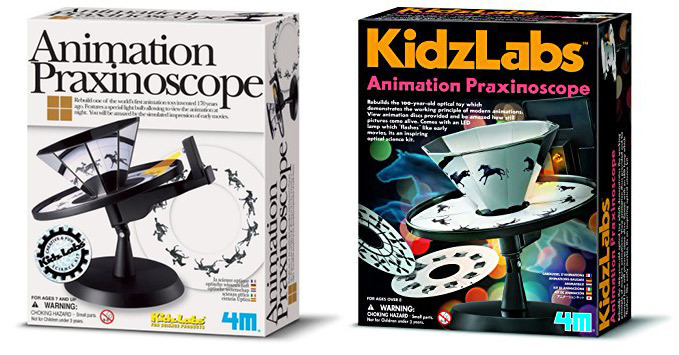 Our Praxinoscopes and Zoetropes are quite small. The printed designs will be quite tiny! You don't need to make a design for both devices; just pick one. Feel free to use color. But: that said, because the graphics will be tiny and dim, and it will probably work best to create simple, high-contrast (black-and-white?) designs. Include an animated GIF of your design. You can generate the frames by pressing 'f' when running your project from my template. Include any preparatory hand-drawn sketches of your design, if any. Embed your code in the post. As a reminder, instructions for doing so are here. Label your blog post with the Category, 02-Scope. Title your blog post, nickname-Scope. SKETCH FIRST! Before doing anything, make some (real) sketches in your notebook. Try to develop a graphic concept. Export your frames from your code computationally (i.e. from code), and then use a tool (such as one of these) to assemble the animated GIF from the frames. Don't use a screencapture program to make your GIF! Also, be sure to create your GIF so that it loops infinitely, and be sure to create it so that it plays back at least 20 frames per second (preferably 30 FPS). These are options you can set with proper GIF creation tools. You may need to specify the frame rate using milliseconds per frame (e.g. 30 FPS = 33 ms/f). Remember, an animated GIF must represent all of its frames with a single a palette of just 256 colors. You may find this resource helpful: tips for making animated GIFs. Want more challenge? Motion blur can make GIF loops look amaaazing. David Whyte from BeesAndBombs has posted some Processing template code for achieving motion blur, and Étienne Jacob has written a detailed tutorial about using this code, available here. Export a series of frames, and compile these into an animated GIF. You can do this with an online tool like http://gifmaker.me/. Alternatively, here is a helpful tutorial for creating animated GIFs from folders of images, using Photoshop. Remember to set the duration of your GIF to "forever". Your GIF can be any length, but keeping it under 5MB is strongly preferred. There are some tools for optimizing your GIF linked from here. In a blog post, upload and embed your animated GIF. Important: Embed the GIF at original resolution. Be sure not to embed any version that has been automatically resized by WordPress; it will not be animated! Also important: please upload your GIF to this WordPress site -- embeds from Giphy or elsewhere in the cloud are not acceptable. Write a paragraph about the experience of creating the piece. Which easing function did you select, and why? Critique your work: where you feel you succeeded, where you feel you fell short of what you'd hoped to achieve. Label your blog post with the Category, 02-AnimatedLoop. Title your blog post, nickname-AnimatedLoop. Below are Processing, p5.js, and Processing.py templates for exporting frames to make an animated GIF loop. If you decide to use the template code, you'll need to rewrite the renderMyDesign() method, which takes a percentage from 0..1 (NOTE: not a frame number!) as its argument. Here is an animated GIF, and the Processing code template that produced it. Observe how the small pink square is moving nonlinearly, using one of the Pattern_Master functions. It has some character!